We’ve already said goodbye to 2016 and can’t wait to see what 2017 brings! Well, we are here again with our most expected collection!! “Best of 2016” is finally here, featuring 3.25GB of sample material hand-picked from a selection of our most popular sample packs released in 2016, collected together to create one neat package for anyone needing the essential ingredients to quickly build a chart-topping track. 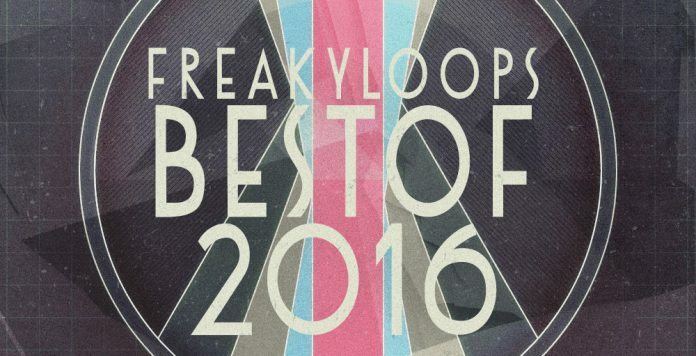 Freakyloops Best of 2016 has everything you need from slammin head nodding heavy beats to speaker cracking synths, nasty wobble basses to rhythmic chords, filth-dribbling stabs to mind-bending leads, sleaze-symphonics to solid subs, deep driving kicks to cracking snares, glitched tops to processed hats, brutal leads to dancefloor lifting FX, inspiring Midi Melodies to best quality massive presets.. You will have all the material you need to create exciting, mind-blowing tracks – you can use them in any way you want to add creativity to your killer productions. There is something for everyone – from Electronica to Future Bass, DnB to RnB, Ambient to Cinematic, Bass Music to Future House, EDM to Dubstep, Garage to Chillout. Including sounds from Dark Heavy Neuro DnB Vol 2, Future Bass, Glitchtronica, Dark Neurofunk & Cinematic DnB Vol 2, Futuristic Electronica, Hardstep, Chill & Tropical House Vol 2, Monster Bass Music, Cinetools: Sinister Drones, Synthwave, UK Underground & US Garage, Cinetools: Space Journey, Nextgen EDM Vol 2 and EDM Rave Drops. All sounds are organised into folders for easy access and can be used in your productions! Everything you need to produce complete tracks from the ground up or embellish your existing productions is in this pack. Whether you are making Bass House, Electronica, Dirty Wobble House, Future House, Dubstep, Trap, Chill-out, Electro, DnB, EDM, RnB, Melbourne, Ambient, House, Cinematic or other forms of electronic music, this huge collection is a great starter point for new inspiration or for adding a hook to your track.